Welcome to the Prairie Arctic Trades Training Centre web page! Please look through our course offerings. We provide trade training and custom learning opportunities for our clients, to meet their needs. Click here to download our new brochure. OK, spring may not be here yet, but we are planning our programing through spring and into the summer! Currently PATTC is running Level 1 and Level 3 Scaffolding training for the Saskatchewan Apprenticeship and Trade Certification Commission (SATCC) in Regina and Saskatoon. One Level 2 and two Level 3 programs are coming up in the schedule, so if you are an apprentice registered with SATCC, you should be getting your notifications for training very soon. Indigenous Leadership Development Institute has passed the half-way point of their 20 week carpentry in Winnipeg, soon the snow will be gone and the new carpenters will be ready to go to work! In February our training centers are picking up after the holiday break! Winnipeg, and Regina will be starting scaffolding programs while Saskatoon will have a 10 week carpentry program firing up. Please check the PATTC website for more information on our upcoming programs. Dumont Technical Institute is offering an Introduction to Carpentry Program from January 28 to April 26, in the community of Cumberland House. Cumberland house is the oldest community in Saskatchewan with an amazing history. Thanks to our partners at DTI and Cumberland House for welcoming us to the community for training. Also Carleton Trail Regional College will be offering a 10 week carpentry program in Muskowekwan First Nation and a 6 Week Carpentry program at Fishing Lake First Nation in the next few months. If you are a member of these communities, please contact them directly for entry requirements and course dates. And remember, PATTC offers programming throughout the summer months, so if you are interested in training over the summer or fall of 2019, please contact us at pattc@myparc.ca. 2018 is rapidly coming to a close and we are looking to fill a few vacancies for the spring season. If your company or organization is interested in training, please contact us as soon as possible. Yep… 2019 -2020 is around the corner as well, if you are interested in training to meet the seasonal needs of a specific trade or employer, now is the time to set that schedule for the fall 2019! Well looks like winter is on its way, but the cold doesn’t slow us down at PATTC! 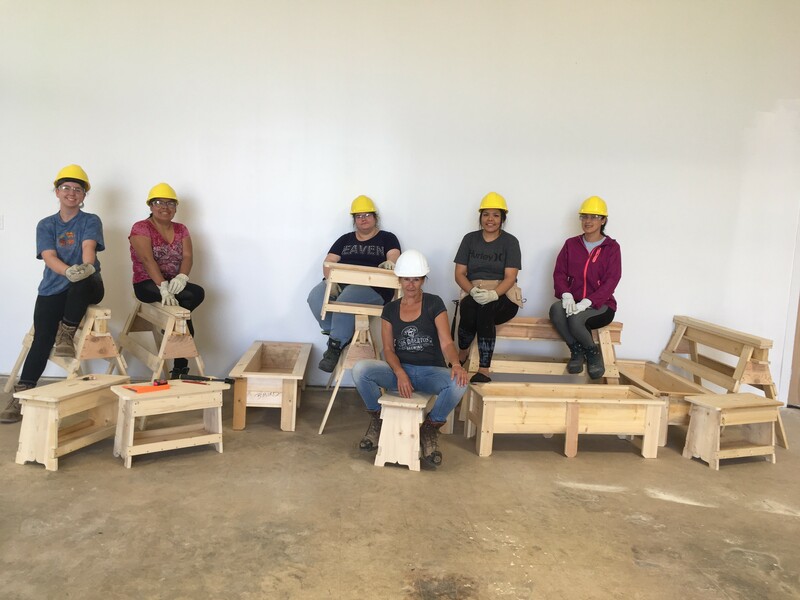 Our program with Indigenous Leadership Development Institute (ILDI) has begun with students learning carpentry skills for the next 20 training weeks. Successful candidates, once indentured as apprentices, will be eligible for 800 hours of trade time credit and essential safety tickets to work in industry. This will be the third year of our partnership with ILDI. We have also recently concluded the 6 Week Commercial Concrete Program at the Winnipeg Office. Big thanks to all the folks who helped make it work! Opaskwayak Cree Nation will be starting a Introduction to Drywall and Framing Program on November 5 2018. The student will be learning the basics on installation and repair of interior systems over the course of the next 6 weeks. Dumont Technical Institute (DTI) has several programs running at PATTC this fall. Currently we have a class of Millwrights (Industrial Mechanics) learning the ropes with our industry proven instructor. The Millwright program is running in the shop located at our Saskatoon Office. For more information about our Industrial Mechanics Program, please look at our offer program offerings. Also, DTI is offering a 6 week Introduction to Scaffolding program in Yorkton with hope to meet the need of employers in the Yorkton/Esterhazy area. The program finishes the second week in November and we have already had employers stopping by to talk to potential employees in their trades. Saskatchewan Indian Institute of Technologies (SIIT) has recently completed an Introduction to Scaffolding program. Good luck to all the graduates with their new careers. Saskatchewan Apprenticeship and Trades Certification Commission (SATTC) is keeping us busy with training their Apprentices. Always great to have the industry fresh faces around the training centre picking up new skills for the workplace and bringing current industry practices back to our instructors. SATCC held their trade board meetings in the Month of October, with PATTC attending the meeting for the Scaffolder and Roofer Trades. Good feedback was provided by the board members with some improvements to the program in process for the New Year. Thanks to Jeff and the team of PDO’s for making the event run smoothly. September is the start of PATTC’s 2018-2019 schedules with Dumont Technical Institute programing for Millwrights and Scaffolders, Scaffolding Pre-Employment with the Saskatchewan Indian Institute of Technologies as well as a Scaffolding Level training on behalf of the Saskatchewan Apprenticeship and Trades Certification Commission. Winnipeg will have an Introduction to Commercial Concrete starting on September 10, 2018, please contact us a pattc@myparc.ca if you are interested in attending. Our partners with Indigenous Leadership Development Institute are offering a 20 week Introduction to Carpentry Program at our Winnipeg location starting in October, please contact them at http://www.ildii.ca/ for more information. This program is accredited for Level One Training with Manitoba Apprenticeship. PATTC is offering CWB testing at our location in Saskatoon on September 13, 2018. If you are interested in attending call Nancy at (306) 934 8224. We still have space in our training schedule and look forward to hearing from you for training needs in the upcoming year. Remember, PATTC offers training at our facilities in Saskatoon, Regina and Winnipeg as well as at your location. Summer hasn’t slowed us down at PATTC; programs have just wound up for DTI in Laloche and in Prince Albert with programs starting up in Saskatoon and The Pas. Summer is also the time we plan our academic schedule for 2018-2019 with slots for Apprenticeship Scaffolding already filled. Please contact us if you have any questions in regard to our upcoming schedule and let us know if we can help meet your training needs for next year. 2018 Dumont Technical Institute Women in Trades program in Prince Albert. Winnipeg is continuing the Indigenous Leadership Development Institute’s 20 week carpentry program. The students are moving out of the classroom with more time in the shop. We are over half-way through the program and looking forward to being ready for work in the spring! Joining them are students from around the Winnipeg area participating in the Prairie Artic Regional Council’s (PARC) 6 week Introduction to Carpentry with the majority of their program focused on safety and concrete work. Level 2 Scaffolding Training runs in Saskatoon starting at the end of January and continuing into the first couple of weeks of February. These students are indentured apprentices and currently employed in the trade. Please visit the Saskatchewan Apprenticeship website for more information on indenturing with your employer and gaining certification through the apprenticeship program. Saskatoon Tribal Council and the Saskatchewan Indian Institute of Technologies (SIIT) are offering courses at our Saskatoon training centre throughout the spring semester. Regina has had a full house for a good portion of the spring. We have apprenticeship training, a PARC sponsored 10 week Introduction to Carpentry program and SIIT 6 week Introduction to Scaffolding program running simultaneously in the facility. Under contract to Carlton Trail Regional College, PATTC is participating in a 6 week Introduction to Scaffolding Program. We appreciate the opportunity to help in bringing training to smaller communities in the province. PATTC is looking forward to assisting Dumont Technical Institute in providing a 6 week Introduction to Scaffolding Program. The program will be offered at the training centre in the community of Ile a la Crosse. Many thanks to folks who are participating and making this possible. We have had an amazing October on the prairies and PATTC is looking forward to run up to the holidays. Lots going on in the training department. We are wrapping up our Introduction to Construction (Concrete) at the Winnipeg office as well as finishing the last bit of training for the folks at Corrections Canada. We will be starting a 6 Week Introduction to Scaffolding Program for a second cohort in November. Our friends at Indigenous Leadership Development Institute begin their 20 Week Introduction to Carpentry in November, There will be a short break in December and then back to school in 2018! Just a reminder, we will be offering a second Introduction to Construction (Concrete) Program in the New Year. We are targeting a start at the end of January. The programs are supported by our partners at Prairie Arctic Regional Council, who cover the cost of tuition and equipment for the students. Our thanks to Opaskwayak Cree Nation for inviting us to train in their community for the next several months. The program will offer an introduction to scaffolding, carpentry and concrete and will assist 8 community members to learn the skills necessary to improve the community. Apprenticeship training is continuing with Level 1 starting November 13, 2017. Saskatchewan Indian Institute of Technologies in cooperation with the Mistawasis First Nation is offering a 6 Week Introduction to Scaffolding Program on the Mistawasis First Nation. The First Nation is working to improve the training and infrastructure for the community and great strides have been made in the last year. Congratulations to everyone in the Community. We have also offered programs to Occupational Health and Safety as well as the ladies from the YWCA in order to promote safety awareness in Saskatchewan. Saskatchewan Apprenticeship and Trades Certification is offering the Level 3 Scaffolding Training in Regina starting in November. Remember, apprentices must contact their local apprenticeship office and indenture prior to attending apprenticeship training. Fall has arrived and training at PATTC is in full swing. Our partners at SIIT are currently running a 6 Week Introduction to Scaffolding. Things are slow but steady in industry right now, however these students will complete with a broad scope of skills and certifications. They will learn basic carpentry skills, brush up on their practical math and learn the importance of team work in construction. Our program also includes industry recognize training in Fall Protection, Confined Space and Fire Prevention Awareness. We also provide Safety Construction Orientation Training (SCOT), which the students will require on many jobsites. Our Level 4 apprentices are in mid-swing of their final level of training with the proficiency examination waiting for them at the end of their training. Our carpentry program has wrapped up and our team is now working with the Level 2 scaffolding apprentices on their way to certification. We would like to extend our condolences to the friends and family of April Lavallee. April has taken training with us on previous occasions and had just completed the carpentry program in Regina. Our staff and instructors will miss having her around our school. Our 6 week Introduction to Construction program is nicely under way sponsored by our friends at Prairie Arctic Regional Council. The program provides introductory instruction to students in the areas of basic carpentry and concrete forming. We hope that our students will now consider a challenging career in the trades! PATTC is very happy to have donated two sound booths to the Saskatchewan Deaf and Hard of Hearing Services. The donation took place August 1, 2017 at the PARC shop in Saskatoon. Construction workers are at high risk of hearing impairment; remember hearing protection must be used in any environment where the sound level exceeds 85 dBA. Any areas where the noise level may exceed 80 dBA are to be posted by the employer. In work areas where the noise levels cannot be reduced, remember to wear your hearing protection!! Summer programs are running at PATTC in Regina and Saskatoon while Winnipeg is on a break until the start of September. Regina’s 10 week Introduction to Carpentry has just passed the half way point with the students working on framing and stair building projects. Saskatoon is welcoming the members of IBEW 529 to continue with their Overhead Traveling Crane and Rigging Programs. This program runs for 40 hours and has a practical and theory portion to the training. Winnipeg’s DOKA form training is done until next year as the students are now all up at the Keeyask project working hard! Over the summer PATTC is preparing for upcoming programs (please check our courses for more information) which included building our 2017-2018 training schedule. PATTC training availability is limited and spots are filling into the 2018 year! Please contact us via our email address at pattc@myparc.ca for more information or to book a training spot for the upcoming year. Prairie Arctic Trades Training Centre has been awarded the contract with Saskatchewan Apprenticeship and Trades Certification Commission to provide the training for the Drywall and Acoustical Mechanic, and the Roofer Trades. Both trades are nationally recognized for Red Seal Endorsement once a student has completed the require trade time hours, spent the necessary years in the trade and successfully passed the Interprovincial Journeypersons Examination. Employers, current apprentices and perspective apprentices are encourage to visit the SATCC Website or contact their local SATCC office to find out further information for the program. These programs are not direct entry and require acceptance to the apprenticeship program to attend. Winnipeg: Training on the DOKA forms system continues for BBE for individuals on their way to employment at the Manitoba Hydro Keeyask project in the northern part of the province. Regina: On June 19, a 10 Week Introduction to Carpentry program will begin at our Regina training location. The training centre will welcome a diverse group of aspiring carpenters. Good luck to everyone. Saskatoon: Members of the IBEW 529 are currently attending an Overhead Crane and Rigging course. Welcome to our colleagues from the IBEW! Summers are for relaxing, but not at PATTC! Winnipeg: We are currently working with the team at BBE Hydro Constructors LP with the training of their staff for the Manitoba Hydro Keeyask Project in Northern Manitoba. The project is using DOKA Formwork and BBE has asked PATTC to provide introductory site training to their staff prior to them heading north. Congratulations to over 500 program participants on this career choice and thanks to BBE for this opportunity to help. We are looking forward to a summer of training at the Winnipeg Center! Saskatoon: We have recently completed Level 4 Scaffolding training for the Saskatchewan Apprenticeship and Trades Certification Commission (SATCC) at our shop in Saskatoon. Best wishes to the newest proficiency holders in the province. Introduction to Scaffolding will conclude mid-April at Mistiwasis First Nation; thanks to SIIT for coordinating the effort to run a successful program. Saskatoon Tribal Council completed an Introduction to Scaffold Class earlier in the month with our friends at the Saskatchewan Indigenous Institute of Technologies having a program wrap up the week of April 10. Programs for Dumont Technical Institute have concluded this month including an Introduction to Millwright at Cumberland House and Introduction to Scaffolding in Regina. Upcoming programs in Regina include an Introduction to Scaffolding in partnership with the Piapot First Nation, Aluma Systems and SATCC. Also, Level One Apprenticeship begins this week in Regina. Carlton Trail College has partnered to provide a Introduction to Masonry program on Gordons First Nation, just South of Punnichy. Thanks going to our friends at The Bricklayer and Allied Craftworkers Local 1 for the direction and assistance in this venture. Scaffolding programs have recently concluded in Lloydminster and in Laloche with 4 of our students joining the local workforce immediately upon conclusion of the class, as well, the Concrete Program in Winnipeg has concluded. The 20 week Carpentry Program in Winnipeg and the 10 week carpentry Program in Big River are still in progress. Saskatoon Tribal Council has partnered with Prairie Arctic Trades to provide a 6 Week Introduction to Scaffolding program at our offices located at 3730 Kinnear Place in Saskatoon which started on February 27, while a Scaffolding Program is scheduled to start on March 6 at the Mistiwasis First Nation. DTI and PATTC are also hosting a scaffolding program at the Regina office. This program has the unique feature of providing essential skills training (one week prior) and safety training (one week after) for a total of 8 weeks of job training and preparation for the students. March 13 will mark the beginning of the 6 Week Scaffolding Program for Saskatchewan Indigenous Institute of Technology (SIIT) at our Saskatoon location. And not to forget, Level 1 Apprenticeship training in Winnipeg, Level 2 Apprenticeship training in Saskatoon and Level 4 Apprenticeship training in Regina all occur in the Month of March! Cumberland House, in partnership with Dumont Technical Institute (DTI), is hosting an 8 week introductory program to the Millwright trade. We have started our fall schedule bookings, please contact us for your training needs! The new year is here and Prairie Arctic Trades Training Center (PATTC) is off to a running start. The 6 week Introduction to Scaffolding Program is underway in Lloydminster with a scheduled conclusion on February 17, 2017. The Lloydminster program is running in parallel with a program in the northern community of Laloche. Many thanks to our contracting partners; the Saskatchewan Indian Institute of Technology (SIIT) and Dumont Technical Institute (DTI) These organizations have demonstrated continued commitment to advancing the skilled trades amongst First Nations in Saskatchewan! We currently have 12 students learning the skills that will benefit themselves, industry and the community for many years to come. The Saskatchewan Apprenticeship and Trades Certification Commission (SATCC) is running a Level 4 Apprenticeship class in Saskatoon and a Level 2 Apprenticeship program in Regina. Remember, apprenticeship training is not a direct entry program, please contact your local apprenticeship offices or PARC in Regina or Saskatoon to obtain more information on how to apprentice in the Scaffolding and Carpentry trades. Indigenous Leadership Development Institute’s 20 week Introduction to Carpentry course has return to Winnipeg classrooms after the Christmas break. Welcome back everyone! Northlands College has completed their six week Introduction to Scaffolding Program on Thursday July 28, 2016. Eight participants have successfully completed and now have the essential skills for a new career in scaffolding. PATTC would like to thank Northlands College for the opportunity to bring technical education to the student’s home town in order to accommodate the blending of career, family and community to support success for their students. We would also like to thank the scenic community of Pelican Narrows for their participation in the program and look forward to continued on-site training in the future. PATTC would like to congratulate all the students on their gradutation and wish them the best in their new careers. PATTC is currently developing our 2016- 2017 training schedule with class times filling quickly. If your company or organization is interested in safety training, introductory training in the Carpenter, Scaffolder or Millwright trades or any of our other course offerings, please contact us at your earliest convenience. Your local office information is located on our webpage under Contact Us. PATTC would like to thank all of the participants in the eight week Introduction to Flooring program which finished on July 8. The program introduced students to basic hand tools and installation techniques for carpet and resilient (vinyl) flooring with a solid background in both theory and practical. In addition, the student receive instruction in workplace safety and OH&S requirements related to the flooring industry. We also would like to thank Prairie Arctic Regional Council for their support during the program. We wish all of our participants a great future in the industry. Thanks to our industry partners! PATTC would like to acknowedge the invaluable support we have received from our many industry partners! Between job training placements, employment opportunities, equipment donations and great updates on latest trends, the help industry has provided has been really wonderful. To those of you at the Saskatchewan Ministry of the Economy, Breck, SteepleJack, Skyhigh, ICON, Chinook and many others - a big thanks! What a fantastic year here at PATTC! Many new classes and new training partners, with great learning opportunities. We will be updating our recent activities soon, and previewing this fall's plans. Stay tuned! Before the update - all the best of the season to you all, from all of us at PATTC! December was a very busy month for us, with the completion of the Regina Introduction to Construction class, several session s of apprenticeship training, the SIIT Introduction to Scaffolding program at Meadow Lake - congrats Val-Gene, on another successful outcome - and teh shorter Basic Scaffolding program at Corcan. Planning for the spring indicates a very busy season ahead with classes full int he north and south of the province. A very busy fall, we have been running a number of classes for several of our clients. Saskatoon saw the graduation of a PARC "introduction to Commercial Construction" class, an SIIT "introduction to Scaffold" class, and our first ever "Introduction to Millwright" program. We've run a number of steel astud and drywall programs for CORCAN, and have an SIIT Introduction to Scaffold class running right now in Meadow Lake. Several apprenticeship classes have also run this fall, and a number of short safety training programs. Regina has seen the completion of a Regina Skills and Training Centre Introduction toi Scaffold class; three levels of apprenticeship training; and a PARC "Introduction to Commercial Construction class, currently running. We are presently working with CORCAN across the Prairies to deliver scaffold training in federal institutions, for which we have the exclusive contract. We continue to support the scaffold apprenticeship program in Manitoba at our Winnipeg centre. A very busy winter and spring lie ahead! A great way to wrap up the school year, with seven sets of specialty training program for our friends at Gabriel Dumont Institute and Dumont Techncial Institute. Congrats to the many grads who completed powered industrial truck, aerial lift, skid steer and fall protection - and a big welcome to our inconming students from our newest client, the Saskatoon Industry Education Council, who will be taking our scaffold user and fall protection courses. In Regina, three groups at the Regina Trades and Skills Centre have just wrapped up - our six week introduction to commercial roofing program; our six week introduction to commercial construction; and our ten week introduction to general carpentry programs. The new storage facility at the RCMP Museum is evidence of the success of these programs. And - so long and happy retirement to Armand Martin, who has done such a great job running the RTSC over the years! Mid-June also saw the completion of the six week introduction to scaffolding program at Pasqua First Nation. Ten of the eleven grads already had jobs before the course ended! We are looking ahead to our upcoming six week introduction to commercial construction class in Saskatoon late this summer, and several more offerings. A great way to start the new month. Virtually everyone from our Regina six week scaffold intro class, SIIT six week Regina scaffold intro class, Saskatoon SIIT 6 week intro to scaffold class, Saskatoon PARC intro to concrete construction class and (next week) Saskatoon Dumont Technical Institute 6 week intro to scaffold class has gone to work! As well, we welcome Gabriel Dumont Institute as a new partner. We are looking forward to our RTSC 6 week introduction to commercial concrete course winding up, great job at the RCMP museum. Our ten week introduction to carpentry program has begun at RTSC with work to continue at the RCMP museum project; and the latest addition to our offerings, the six week introduction to commercial roofing program, will begin at RTSC the first week of May. We are currently running a two week asbesto abatement program in Saskatoon, and will be starting a six week scaffold introduction program at Pasqua First Nation on May 4, with great job prospects at the K+S Legacy project on the horizon. March certainly went out like a lion, with buildings full to capacity and outreach programs running around Saskatchewan. Congrats to our grads at CORCAN, and to the departing Level II and III apprentices in Saskatoon and Level III, I and II apprentices in Regina. The Prairie Arctic Regional Council`s "Introduction to Commercial Construction" class completed in Saskatoon, with half the class currently employed already. As well, the Saskatchewan Indian Institute of Technology`s "Introduction to Scaffolding" class in Regina has headed out to the workforce, well done! We're very busy welcoming the Saskatchewan Indian Institute of Technology "Introduction to Scaffolding" class in Saskatoon, as well as safety training for the Saskatoon Trades and Skills Centre. We`re also welcoming a new partner - Dumont Technical Institute has a number of safety courses here, as well as a full six week "Introduction to Scaffolding" class with a lot of enthusiastic students. In Regina, we say hello to the The Prairie Arctic Regional Council's "Introduction to Scaffolding" students, who are progressing well through their training; and to the Regina Trades and Skills Centres"Introduction to Commercial Construction" program - their class project this year can be found out the the RCMP museum, watch for future details. We will soon be starting a ten week RTSC "Introduction to Carpentry" pre-employment program, who will be working on the same project. Finally, our Winnipeg centre also welcomed a new client by running a one week scaffold overview for CORCAN at the Stoney Mountain facility. It's a grast opportunity for students to get an introduction to a future career choice. As February winds down, we reflect on what turned into a very busy month. The level 3 apprentices in Saskatoon are just wrapping up a big hoarding project, and will soon be returning to their jobs. We also have two accredited six week introduction to scaffolding courses underway at CORCAN in Prince Albert. Here's a new initiative - through the Canada-Saskatchewan Job Grant program, the Prairie Arctic Regional Council (UBC) is funding a six week introduction to commercial construction program. We had a lot of interest in this program and are currently about half way through with a full class. We will be starting a second funded program, introduction to scaffolding, at our Regina centre in a few weeks. We are currently running an introduction to scaffolder program at our Regina centre for the Saskatchewan Indian Institute of Technology, with many employers expressing interest in hiring the graduates. Good luck with your studies! As February draws to a close, we also say so long to the level 2 Saskatchewan Apprenticeship and Trade Certification Commission apprentice class, who will be returning to their workplaces and readying for level 3 training - see you next year. We are soon to welcome a split level 1 and 3 class at the Regina centre for their next training session. For our friends at the Saskatchewan Indian Institute of Technology, we have just started a six week scaffold course in Regina; and will be starting a similar program right away in Saskatoon. Hopefully, mine construction in the southern part of the province will provide some great employment opportunities for the graduates. We've successfully completed both level 1 and level 2 of the new scaffolder apprenticeship program at our Winnipeg training centre Great job, everyone! Additionally, level 3 scaffolder apprenticeship just wrapped up in Regina, and Level 4 was completed in Saskatoon with the class challenging the Saskatchewan Apprenticeship and Trade Certification Commission's certification exam on their last day. We've also been designated the training provider for CORCAN at the Prince Albert facility - for both scaffolder and drywall/steel stud training. We hope to be providing training in both those areas in the near future. As well, we will be delivering a one week introduction to scaffold basics program at Stoney Mountain in Manitoba in the first week of March, and are very excited about this opportunity. Keep tuned, we have more program announcements coming up in the next few weeks. Congratulations to the graduates at the Regina Trades and Skills Centre! The Hardwood/Laminate Flooring and Ceramic Tile PATTC course has wrapped, and everyone has successfully completed. According to our instructor, attendance was great and there was a lot of enthusiasm, and hard work in completing all of the practical projects. Well done, everybody! We are also saying "so long" to our completing scaffold apprentices, level 3 in Saskatoon and level 4 in Regina. Best of luck to the level 4's, who write their Saskatchewan Apprenticeship and Trade Certification Commission's certification exams. And, a big hello to the new level 1 apprentices who start December 8 in Regina - welcome aboard! To all of our friends and partners, have a great Christmas and a Happy New Year from all of us! Level 1 apprentices (Saskatoon) and level 3 apprentices (Regina) have just finished their levels of training. Good job, everyone! Our hardwood/laminate flooring class is progressing well at the Regina Trades and Skills Centre - and if you are interested in any of their other offerings, take a look at rtsc.org. We're getting ready to welcome the level 3 apprentices (Saskatoon) and the level 4 apprentices (Regina). The Saskatchewan Apprenticeship and Trade Certification Commission will be offering certification exams to level 4 apprentices on the last day of training, good luck and study hard! We've just wrapped up a level two scaffolder apprenticeship program in Saskatoon for SATCC, and welcome a new level one class. Regina has a level 2 apprentice class in progress, soon to be joined by a level 3 class. The Saskatchewan Apprenticeship and Trade Certification Commission (SATCC) has a full slate of classes scheduled well into 2015. Congrats to the Saskatchewan Indian Institute of Technology's students, who just completed a six week Introduction to Scaffolding class in Saskatoon - the majority of the class are already working as scaffolders! Just underway is the hardwood/laminate flooring program for Regina Trades and Skills Centre. This course has an add-on one week module for ceramic tile installation, a new program for us and one which should help the graduates develop some great skills. © Copyright Prairie Arctic Trades Training Centre. All Rights Reserved.